YPSA with the support of Campaign for Tobacco Free Kids, arranged a human chain on 6th June’17 in front of Chittagong Press club to express the reaction and protest the budget proposal on tobacco. Finance Minister declared national budget for the fiscal year 2017-2018, but this budget will clearly promote the multinational tobacco companies, while tobacco prices will go down in real terms. The proposal to keep prices of higher and premium segments of cigarettes and smokeless tobacco (gul, zarda) products unchanged in the budget which goes awfully against public health. Even there is no reflection of the Prime Minister’s pledge made in 2016 about a simplified and effective tobacco tax system. The participants of the Human chain said that the taxation on tobacco products is not satisfactory. Finance Minister said in the budget speech that tobacco is harmful for public health and causes deaths and diseases, but in the budget, there is no such reflection. The participants from the human chain also said that smokeless tobacco products, high and premium cigarette companies will be benefited from this proposed budget and this is not a people friendly budget rather it is company friendly. So the speakers from the human chain demanded to review the budget proposal for the sake of public health. The participants also welcome the initiatives to increase health development surcharge from 1% to 2.5% which is the most positive progress in proposed budget. Mr. Giaus Uddin, Councilor of Chittagong City Corporation, Md. 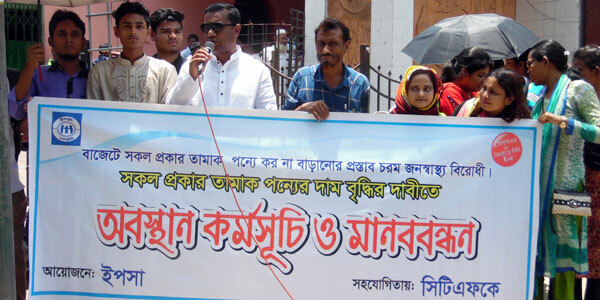 Alamgir Sabuj, Convener of ATMA-Chittagong region, Journalist, Coalition members, Smoke Free Youth volunteers group, and Persons with disability network of Chittagong University were present in the human chain.